The Savoy Palace, considered the grandest nobleman's townhouse of medieval London, was the residence of John of Gaunt until it was destroyed in the Peasants' Revolt of 1381. It lay between the Strand and the River Thames – the present Savoy Theatre and Savoy Hotel were named in its memory. In the locality of the palace the administration of law was by a special jurisdiction apart from the rest of the county of Middlesex, known as the Liberty of the Savoy. In the Middle Ages, although there were many noble palaces within the walls of the City of London, the most desirable location for housing the nobility was the Strand, which was the greatest part of the ceremonial route between the City and the Palace of Westminster, where the business of parliament and the royal court was transacted. Other advantages of the Strand were that a house could have a water frontage on the Thames, the great water highway, and be free of the stink, smoke, and social tumult of the City of London downstream and generally downwind to the east, and its constant threat of fires. In 1246 King Henry III granted the land between the Strand and the Thames, on which the palace was soon built, to an uncle of Queen Eleanor, Peter, Count of Savoy, whom he created Earl of Richmond. The house the Count of Savoy built there later became the home of Edmund, Earl of Lancaster, and his descendants, the Dukes of Lancaster, lived there throughout the next century. In the 14th century, when the Strand was paved as far as the Savoy, it was the vast riverside London residence of John of Gaunt, a younger son of King Edward III who had inherited by marriage the title and lands of the Dukes of Lancaster. He was the nation's power broker and in his time was the richest man in the kingdom second to the king. The Savoy was the most magnificent nobleman's house in England. It was famous for its owner's magnificent collection of tapestries, jewels, and other ornaments. Geoffrey Chaucer began writing The Canterbury Tales while working at the Savoy Palace as a clerk. During the Peasants' Revolt led by Wat Tyler in 1381, the rioters, who blamed John of Gaunt for the introduction of the poll tax that had precipitated the revolt, systematically demolished the Savoy and everything in it. What could not be smashed or burned was thrown into the river. Jewellery was pulverised with hammers, and it was said that one rioter found by his fellows to have kept a silver goblet for himself was killed for doing so. Despite this, the name Savoy was retained by the site. The arrow added to this 1593 map of Westminster indicates the Savoy. It was here that Henry VII founded the Savoy Hospital for poor, needy people, leaving instructions for it in his will. It was opened in 1512. The grand structure was the most impressive hospital of its time in the country and the first to benefit from permanent medical staff. In 1642 it became a military hospital, before being converted into barracks (for the Foot Guards) in 1679. A century later, much of the structure was destroyed in a fire; at the time it housed a military infirmary, prison and recruiting station. In the 19th century the remaining hospital buildings were demolished. 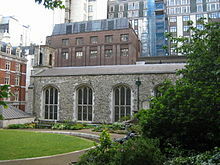 The only hospital building to survive the 19th-century demolition was its hospital chapel, dedicated to St John the Baptist. It once hosted a German Lutheran congregation, and is now again in Church of England use as the church for the Duchy of Lancaster and Royal Victorian Order. Before taking up folk music, the young Martin Carthy was a chorister here. The Savoy is remembered in the names of the Savoy Hotel and the Savoy Theatre which stand on the site. Many of the nearby streets are also named for the Savoy: Savoy Buildings, Court, Hill, Place, Row, Street and Way. Savoy Place is the London headquarters of the Institution of Engineering and Technology. ^ "VCH: "Hospital of the Savoy"". British-history.ac.uk. 2003-06-22. Retrieved 2011-12-21. ^ Osborne, Mike (2012). Defending London: A Military History from Conquest to Cold War. Stroud, Gloucs. : The History Press. ^ "Hospitals - Hospital of the Savoy | A History of the County of London: Volume 1 (pp. 546-549)". British-history.ac.uk. 2003-06-22. Retrieved 2011-12-21. ^ Stanford, Charlotte (2015). The Building Accounts of the Savoy Hospital, London, 1512-1520. Rochester, NY: Boydell. p. 456. ISBN 978 1 78327 066 8. This page was last edited on 17 June 2018, at 18:06 (UTC).